Cain Velasquez underwent shoulder surgery Tuesday. 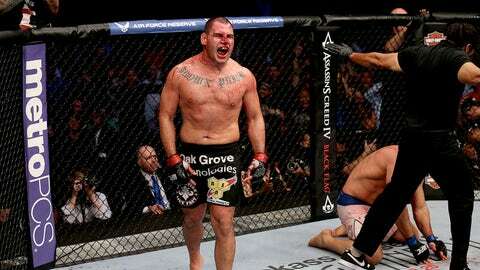 Remember that shoulder injury that wouldn’t require surgery for UFC heavyweight champion Cain Velasquez? Bad news. That proclamation was apparently premature, as the champ is back on the shelf after being forced to undergo an operation to repair it on Tuesday. The procedure mended a torn labrum in his left shoulder, Ariel Helwani reported on Wednesday’s edition of UFC Tonight, citing sources close to the situation. Originally, it was believed that Velasquez’s shoulder, which was injured in his most recent title defense against Junior dos Santos, would heal adequately with physical rehabilitation. However, after the therapy failed to improve the problem, surgery was deemed necessary by his medical team. The timeline is similar to that of the injury he suffered on his right shoulder in 2010, when he tore his rotator cuff in his title win over Brock Lesnar. Afterward, Velasquez did two months of rehab, but an MRI afterward showed that the tear was actually worse than originally thought, and he underwent surgery. In that case, Velasquez (13-1) returned about 10 months after surgery, losing to dos Santos at the inaugural UFC on FOX event. In this instance, sources with knowledge of the situation told Helwani that they are expecting his return somewhere near the end of 2014, although a more specific date remains far off. If that projected timeline proves right, it would mark an overall layoff of about one year. As a result, the question of the 31-year-old champion’s next opponent might be put into limbo. Prior to his injury, Velasquez had been expected to defend the title against Fabricio Werdum, possibly in the UFC’s entry into Mexico. However, Werdum has only fought a single time in the last 18 months, and he may be hesitant to wait any longer on Velasquez’s return.